With the warmer temperatures in the GTA the risk of outdoor sports recreational activities increases. 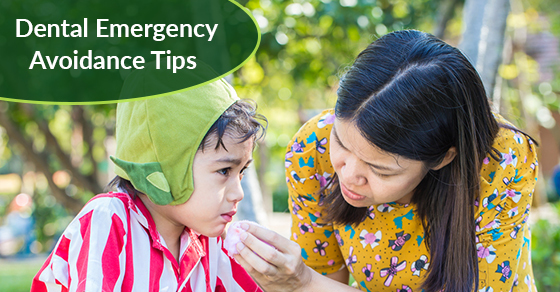 Tips for avoiding dental emergencies resulting from oral injuries and trauma and tips for lessening the damage from the sequela after trauma will be discussed in this article. Dental emergencies caused by injuries to the soft tissues such as the lip, gums, tongue or the intra-oral tissues of the cheeks are common reason for walk-ins to a dental office. It is also not uncommon to have dental emergency clinic patients as walk-in with fractured teeth, partially or completely knocked out teeth. Traditional summer activities including swimming, cycling, football, skateboarding often can give rise to accidents and misadventures which result in a dental emergency. A sports mouthguard, preferable made from a custom impression at a dental office is essential for contact sports and advisable for non-contact sports such as basketball, baseball or even soccer. A dental emergency resulting in an avulsed or knockout tooth where the entire tooth is fully displaced out of the socket should involve the re-implanting of the tooth within 30 minutes if the tooth is to have a good chance of surviving, as the periodontal ligament around the tooth will have an increased likelihood of reattaching itself to the bony socket or alveolar bone. The tooth may require endodontics or root canal therapy at a later date due to nerve pathology which began to slowly occur at the time of the injury which resulted in the dental emergency. Luxated teeth or teeth that have been displaced out of alignment should be re-aligned with very gentle pressure and no forcing of the tooth back into the socket should ever be done.The injured person should then be seen by a dental professional as soon as possible for treatment of the dental emergency. Regardless of the damage to the teeth, a dentist should be consulted immediately for clinical examination with the treatment dependent on the severity of the fracture. Often delays and procrastination due to factors such as patient’s fears of dentist, neglect, misplaced priorities and indifference result in situations where an even more severe dental emergency arises at a future date than the dental emergency at or around the time of the accident.